Our sweet Esther. Losing her was a tragedy that gave birth to a wonderful blessing. Today's the day I stop and express my gratitude for a couple of the amazing blessings in the life of the farm, that just happened to have occurred on the same day of the year - January 26. First, three years ago, Susie Gibbs sat down with me and explained all about the CSA model of her fiber farm, which continues to revolutionize the fiber world. This model emphasizes community over commodity, and people over products. To hard-line retailers, this stands everything on its ear. Yes, spinners and knitters are looking for good yarns and rovings, but even more important to them is a sense of belonging. And since that's important to me, too, I'm more than delighted to provide an environment where relationships grow and multiply, as we ply our fiber craft (no pun intended) together. The door to the Little Red Barn is always open for old-comers and new-comers. Inspired by Susie and her farm, Jacob's Reward Farm is developing and maturing into its own unique kind of place. People instantly feel at home. We become friends, we share our joys and sorrows, we network our businesses, and everything takes on a richness it lacked before. We keep our animals happy, healthy and accessible, and busy providing the quality fiber we love. There's still lots to learn - challenges to overcome, mistakes to make and correct, successes to celebrate, and joys to share. Thank you, Susie, for getting us off on the right foot. We can't wait to see what tomorrow holds. Judah's first day on the job. The sheep were terrified. 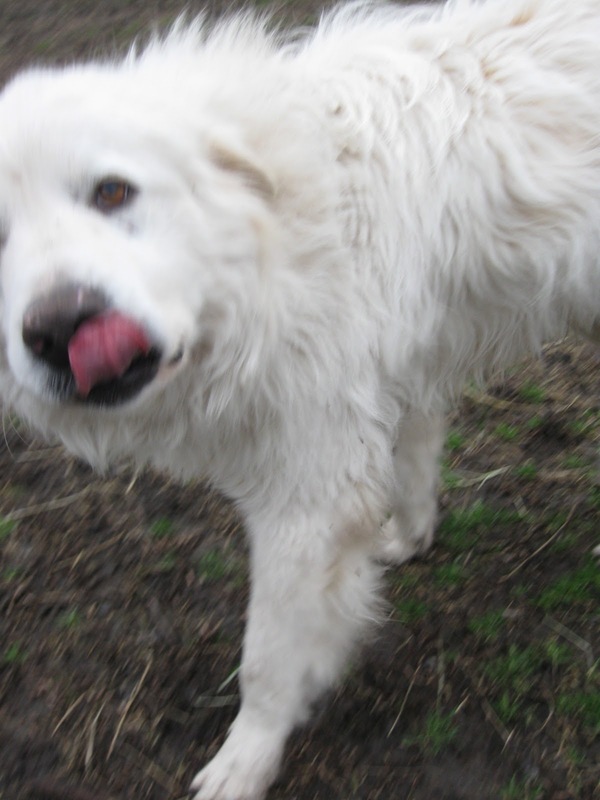 The second thing we celebrate on January 26 is the arrival of our first Livestock Guardian Dog (LGD) Judah, adopted from Texas Great Pyrenees Rescue. 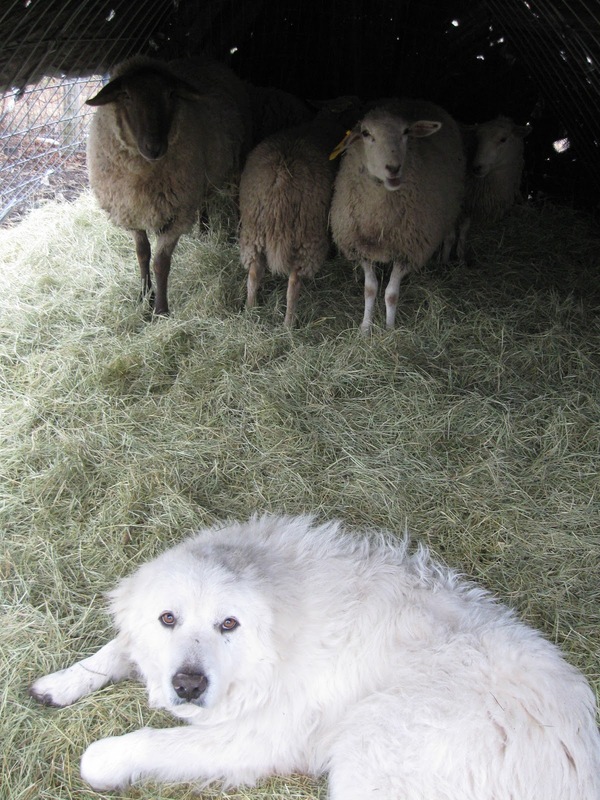 Not all the Great Pyrs that the rescue group takes in are suitable for guard work, so our friend Susie Shirley evaluates them on her property with her goats. Judah did a wonderful job for her, so we had every confidence he would do well here. I had no idea just how wonderful he would be. He has a great disposition toward us and the sheep, and he has none of the bad habits Pyrs can display - digging, fence jumping, wandering, etc. I just assume he really likes being here, because he could certainly leave if he wanted to. Slowly, the sheep begin to trust this big white bear. Our sheep took a little while getting used to him, and now they are fairly at ease around him. And they are definitely safer with him on guard in the pasture. I never ever want a repeat of the coyote attack that pushed me to get Judah in the first place. Now, with the addition of Ruthie in the field with him, we have quite a lovely set up. The Maremma puppies, coming in late February (be still, my heart), will eventually allow us to provide protection for all our valuable fiber animals and chickens. He's really just a big white love-bug once you get to know him. So, as you can see, it's a very special day. Makes me want to give something away. Here's two skeins of beautiful hand spun Jacob yarn - 4 oz. and about 200 yards each of worsted weight smooshy, springy goodness in a rich natural brown. If you've never knitted with Jacob wool before, you owe yourself this tactile treat. Comfort food for your fingers... hand spun Jacob. Leave a comment here about anything you like, by midnight tomorrow night (Thursday), and we'll pick a winner at random. You're already a winner in my book, but that's how these things work, ya see. Have an extra special "Eureka! Day" today. Watch for the special blessings that just might change your life. Wow CIndy! You don't need a giveaway to inspire folks to want to leave a comment for such a significant grand day! Looking back on the approx. 18 months I have been involved with Jacob's Reward, I am amazed at how much you, your critters and the rest of the JR gang have impacted my life in so many wonderful ways! Congratulations on such an auspicious day! (Love) Some day, when I get a job that contributes income to our family, I want a share in your farm, too. I wish I were closer so I could visit. Visiting your farm is always a special day because it is such a wonderful place! Congratulations on your special day. You have accomplished many amazing things since you started; your hard work, dedication, and inspiration have given us all a fiber sanctuary to love! I will admit, I'm a little unclear when it comes to identifying Great Pyrs and Maremmas on sight. Gorgeous yarn, and love the blog. Hope to visit the farm soon! Thank You, Thank you, The above comments are very true! What a way you have all come! Our best wishes to you and the Barnies! Steve and I just love keeping up to date with all your news! Steve's still spinning when time allows and now we have a Jack Russell staying with us on his holidays. Can't imagine your sheep getting on with him as well as Judah! HAPPY EUREKA DAY to my BFF!!! Best Farm Forever:)) My own Eureka Day was the day I discovered Jacob's Reward Farm and was told that "yes, you may return to pull my weeds and rake more poo, if you like." I discovered that I just might be able to endure life in the city (and stressful teen years) if I could retreat to a wonderland with a little red barn and a shepherd/friend with a heart as big as JUPITER! I LOVE YOU, Cindy, and thank you for everything you do for all of us. YOU ARE the Special Blessing that DID change my life ! I am so happy to have run across you, the farm and your blog. Hopefully I'll be able to come out and spend time with you and your community some Saturday. Today was my first visit but it surely won't be my last! I really enjoyed seeing pictures of your critters! Thank you for the chance to enter your giveaway! I've never knit with Jacob but would love to try it! Marty and I are so glad to have met you. You are always so welcoming and every visit to JRF is like a mini-vacation! Your kindness is contagious. Thank you for so willingly sharing your blessings with everyone you meet. Happy Eureka Day!! Cindy, ever since we chatted at Cat's class and you told me about your farm and its philosophy, I thought I'd love it. After (FINALLY!) getting to visit, now I know I do! As a science teacher, I love how you are providing ways for people to connect with "nature." And even more than that... the community that has been created... that's a priceless blessing! I thank God for your "Eureka!" moment, and hope to find my way back to Jacob's Reward again soon. How nice to learn the 'back story.' May you have many more Eureka moments. Eureka is an appropriate name for this awesome date!! I just love how both Susan and You are pushing the CSA envelope and building a better sense of community for all of us fiber addicts! Thank you Cindy for so, so many Eureka Days you've provided for all of us! Happy Eureka Day! I'm very glad to be able to watch as your farm grows. Love those wonderful LGD photos! Looks like a sweet pup. I am so happy for you and your flock. I am honored to know youand to support your CSA in any way I can. I only wish I lived closer physically, so I could come visit the LRB. Until then, I'll live vicariously through the lovely, humorous, heart-touching posts on your blog. Thank you for sharing yourself with all of us! I visited a year ago, I didn't get my hands in a wheel since they were taken and I was to shy to ask. Hopefully my dear husband can druve me over there one of this days to try it! *Sigh* I missed. Oh well. Don't worry Kate - another giveaway coming up on Friday, and this is a HUGE one! Stay tuned!